Last week we commemorated the Dedication of St. John Lateran Basilica in Rome as a sign of our union with the Pope and of our gratitude for the papacy. On November 18, we will commemorate the dedications of two other basilicas, namely St. Peter and St. Paul. Sometimes they are referred to as the two great pillars of the Church. Both were martyred in Rome, and each basilica was built on the tomb of each of these two saints. 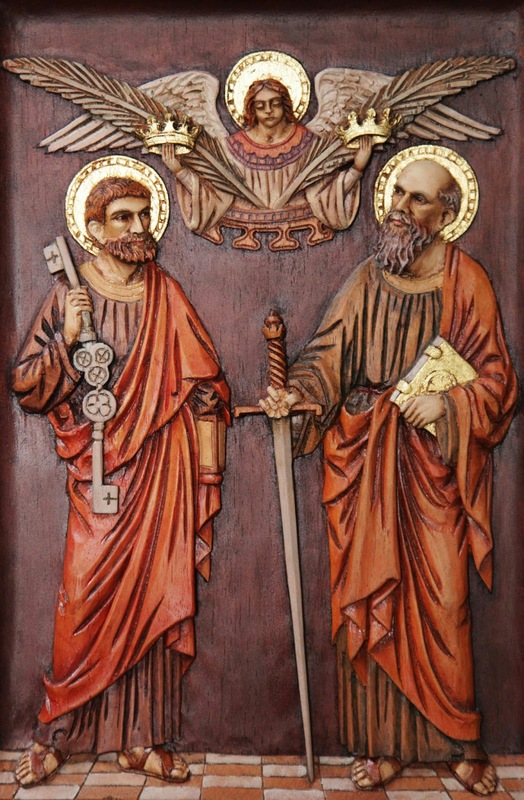 On this day we honor Saints Peter and Paul for their fidelity in doing God's will. We also thank God for giving us the truth and Sacraments through the mission of these two great Apostles. November 21 is the feast of the Presentation of the Blessed Virgin Mary. Once again this feast comes from the consecration of a church. The church is in Jerusalem and it is dedicated to the Presentation of the Blessed Virgin Mary. We call to mind the fact that Mary gave herself completely to God in her childhood. By virtue of her immaculate conception, she was unencumbered by original sin or by any sin. She was full of Grace. She had free will and could have refused God's love, but she continually chose to cooperate with God's will. It was easier for her to do this than for us. We, even after our Baptisms, are hampered by concupiscence and weaknesses caused by personal sins. The Church on this day again reminds us to use Mary as an example and as our intercessor to get us to dedicate ourselves to God completely. Remember that God does not ask the impossible. He wants us to live our ordinary lives in his Grace, that is, by keeping his Commandments and everything He has taught us in the Gospel. As He did with our Lady, He does with us; He gives us all of his powerful help, his strength and his love. During this week we also remember other saints like Saint Elizabeth of Hungary, Saint Rose Philippine Duchesne and Saint Cecilia. Their lives also are examples of how we can serve God and others. All of them pray for us and help us to live in happiness here on earth and forever in heaven.